Might I tempt you with a delicious recipe?? I thought so! 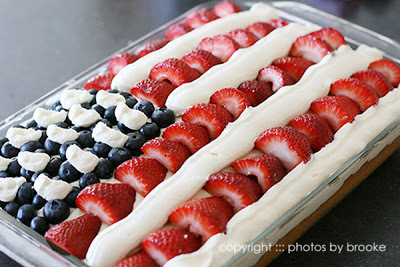 I posted this A Patriotic Flag Cake Recipe on my blog a few days ago and wanted to share it with you crafty peeps too. Just looking at this picture makes my mouth begin to water! 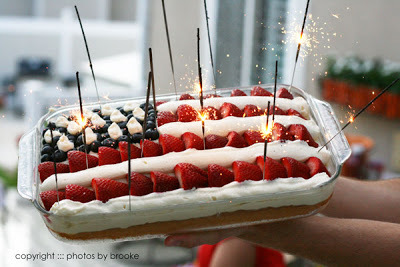 I decided that I really wanted to make one of those 4th of July cakes that I’ve seen various places online. But I wanted it to be pretty easy and not too time consuming. So I just kind of mixed and matched a little something together. Here’s how I made this gloriously delicious cake. I made the 9×13 inch version according to Ms. Betty’s directions. You could surely make your own homemade cake but like I said, I wanted fast and easy. Thank you, Betty C. Let the cake cool completely. In the meantime, I was on the search for the creamy frosting part of the cake. I knew I wanted to make homemade whipped cream but also wanted cream cheese with it. HEALTHY, I know. 🙂 So after extensive Googling and a little bit of frustration I finally found this recipe and trust me, IT DID NOT DISAPPOINT. It was like we were meant to be together. Beat the cream cheese, sugar and vanilla together until smooth. In another bowl, whip the heavy cream until stiff peaks form. Oh deary me. If I didn’t just happily celebrate my 9th wedding anniversary, I would consider marrying this frosting. It’s SO good. So I took some of the whipped cream and generously spread it onto the top of the cooled cake. Then I added a whole bunch of blueberries in the shape of a square. I had sliced the strawberries in half, then I lined them up in rows, kind of overlapping each other, with a space in between the rows. Finally I took the rest of the delectable cream cheese whipping cream frosting and put it into a big ziplock bag and snipped a hole in the corner (because I’m fancy like that) and basically piped the frosting in between the rows of strawberries. And the big sloppy blobby “star” wanna-be thingies on top of the blueberries. Ta da! 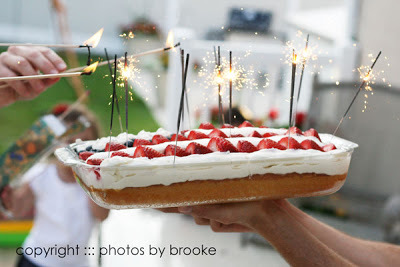 At the family BBQ we wanted to make an exciting presentation when we brought the cake out, so we decided to add sparklers! Woo hoo! Still dreaming of how yummy that cake was…..
Oh and yes, I realize that this edible flag conconction is not anatomically correct. The strawberries were too chubby to allow room for all 13 stripes. Oh, and the stars were too blobby and I was too lazy to do 50 of them. I promise, I truly do like the 50 states as well as the 13 original colonies though. They are ALL special. 🙂 But seriously, make this cake. Or at least make that frosting and eat it all by itself. And then go jogging for probably 5 days straight. wow, what a fantastic cake! My mouth is watering just thinking about that frosting. LOVE cream cheese frosting. So yummy Brooke-I need that cake right now!! What a beautiful cake!! I can’t wait to try it out. Thanks for sharing, and keep up the great blog. You know what’s also cute? I was going to make a fruit pizza for a 4th party but instead made individual cookies instead of the pizza (you know, the crust is store bought sugar cookie dough). I decorated each cookie diffently with strawberries, and blueberries (you could use other red and blue fruit). They were really neat and easy. Oh, yum!! How perfect for summer! Thanks for sharing … I’ve posted a link.